I’m done making excuses. This is not your average Coleslaw. This is not your run of the mill, sweet, tries to taste like Grandma’s coleslaw. This is full on Keto Coleslaw. Throw out the sugar, forget the sweet, and embrace the savory, meaty goodness. 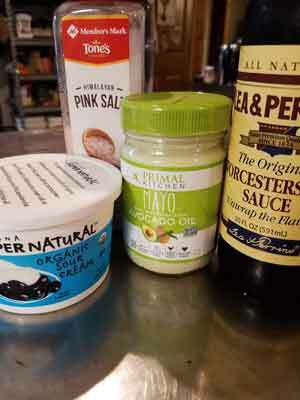 Keto Swine Slaw is here. And it is good. I have tried to make a great Keto Coleslaw numerous times. Every time, I’ve used my own go-to coleslaw recipe from before we went ketogenic. It had a dressing made of mayo, apple cider vinegar and honey. Totally Paleo and full of real food ingredients, but that’s more sugar than we want to include in our diet now. I’ve made a Whole 30 compliant coleslaw in the past, where I left out the honey and added diced grapes and apples. And that was tasty but still more sugar than what I want right now in my keto way of eating. So I was left with substituting Keto-friendly sweeteners. Monk fruit, stevia and Swerve are usually my favorites when I need a touch of sweetness in a recipe. But they all left something to be desired. The flavor just wasn’t good enough. I felt like I was trying to pretend what I was making was something it wasn’t. What if I quit trying to make my slaw sweet? What if I amped up the fat and added some protein? Could I make a slaw that would satisfy? My friends, the answer is yes. We love this keto-friendly salad. It’s really an all-in-one ketogenic meal. The macros are good. The flavor is fantastic. I think I’ll be perfectly happy to never eat a sweet coleslaw again. Thanks to the swine! Keto Swine Slaw is savory. It’s meaty. It’s cheesy. It is not sweet. And I’m not even sorry. And I used pre-cooked bacon crumbles. Because sometimes life calls for short cuts. Feel free to fry up some fresh bacon and crumble it in there. It’ll taste fantastic and you can save the grease for another occasion! ProTip: Note that this recipe has 6 Net Carbs per serving. 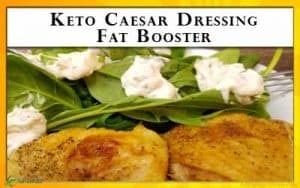 I think of this as a ketogenic main-dish, but if you want to use it as a side-dish or just want to lower the carbs, there are a few things that you can modify. 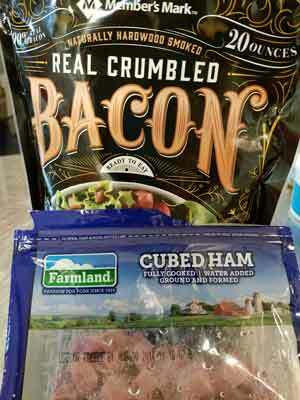 Leave out the ham, and add more bacon. Still yummy, but lower carb by nearly 2 grams. 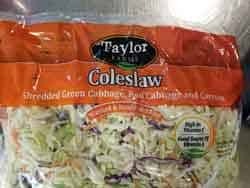 Replace the coleslaw mix with just shredded cabbage. That will lower the carbs by a little over 1 gram. Savory, meat, and satisfying, this is not your average coleslaw. 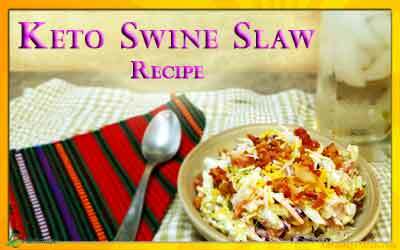 This Keto Swine Slaw uses the power of the pig to bring a ketogenic coleslaw to your next picnic, outing or easy lunch. 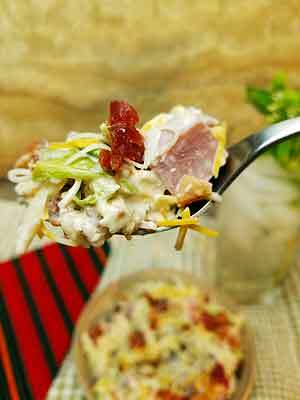 Place coleslaw mix in a bowl that has a lid or that you can cover. Pour dressing over slaw and mix well. If there’s room, add shredded cheese, ham and bacon crumbles. If not, wait to add those last three ingredients until the slaw has started to breakdown and shrink, about 2-3 hours in the refrigerator. Cover slaw and refrigerate for at least 4 hours. Overnight is best to marry the flavors. 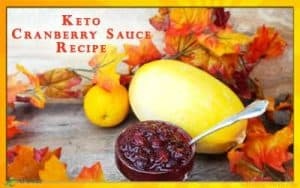 If you liked this Ketogenic Recipe, here are some more keto friendly recipes you might enjoy.